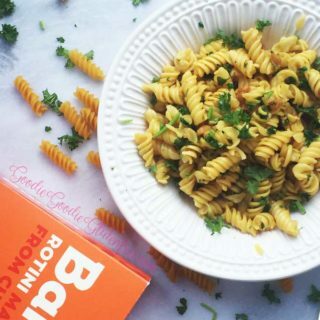 The perfect gluten-free pasta recipe for garlic lovers and lovers of easy, easy cooking! Gluten-free, dairy-free, nut-free, vegan and deliciously clean. An easy recipe that takes 10 minutes to make! Serious score points here. My apartment smelled like homemade garlic bread yet there was no bread to be seen. It was the garlic. And it smelled divine! First I added a bit of olive oil to the pan alongside a tiny bit of garlic powder. I let it simmer on low. Through each simmering moment, the smell of the garlic bread spread throughout my apartment and I was instantly in my mind transported to the best childhood pizzeria experience in Long Island at Vinny’s Pizza. Far before we knew anything about Celiac Disease. Far before healthy or health conscious. It was a long past time to go with my dad and sister to get garlic knots and pizza. And I can literally smell it now. With that said that past time smell of garlic bread reminded me of what I was making the night I had nothing in my apartment. I mean nothing! I had no fruit, no veggies. I was long overdue for a supermarket shop. I could have ordered food but as a Celiac and a clean eater, I often prefer to cook my own meals because cross-contamination over time can really affect someone with Celiac Disease. Knowing that I can always create something I headed to the kitchen. I was lazy. I wanted easy. I grabbed a box of Banza totally not in the mood for your standard pasta marinara. So I went olive oil and garlic. And of course, I didn’t have fresh garlic because I hadn’t gone to the market. Instead, I had dried herbs and dried garlic powder. And guess what? I love dried herbs I use them all the time. I also use fresh ones. It really depends on my mood, and what I have in the kitchen, but dried herbs SAVED the day! But I didn’t just cook the pasta and throw on some dried garlic. It would never taste like garlic bread if I did that. Pulease. Instead, I prepared it differently. And that made ALL the difference. Why Banza right? You’ve heard mixed reviews right? I hear ya. For me it was different. For me, I hadn’t had pasta since 2014 due to elimination diets like Whole 30 and Paleo that excluded anything processed or found in a box. Plus finding out I had a severe sensitivity to corn, rice and soy made it even harder to indulge in a simple pasta dish. So when Banza made their appearance at the Gluten-Free Allergy-Friendly Expo back in 2015, I was so excited to try it! Banza has zero of my allergens and it is made from chickpeas, pea protein, and tapioca. 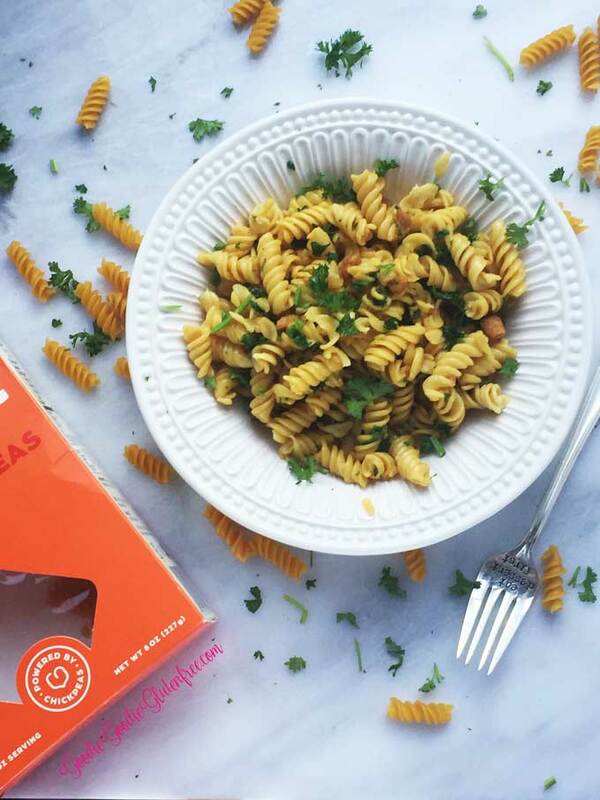 This is the best protein pasta I’ve ever had! 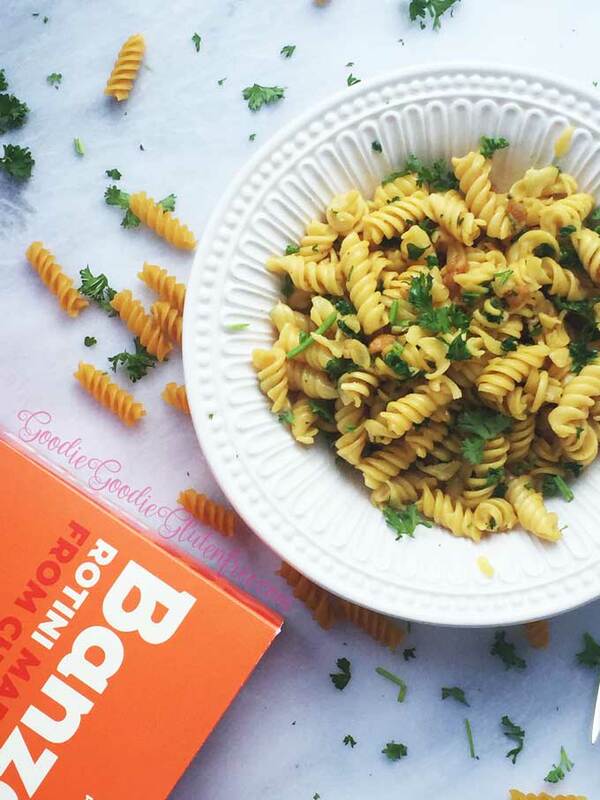 It makes you full, unlike normal wheat or corn, or rice pasta you’re left tired and full. In this case, because Banza is a natural protein pasta it makes you feel satisfied and keeps you full without that full feeling. 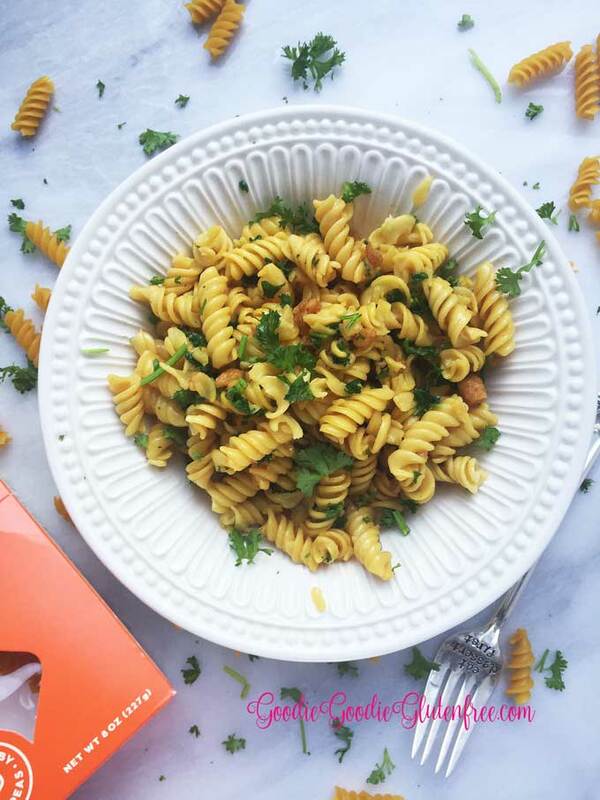 Banza is at an advantage because it’s the only legume pasta I actually like. Most are mushy. This one is not. 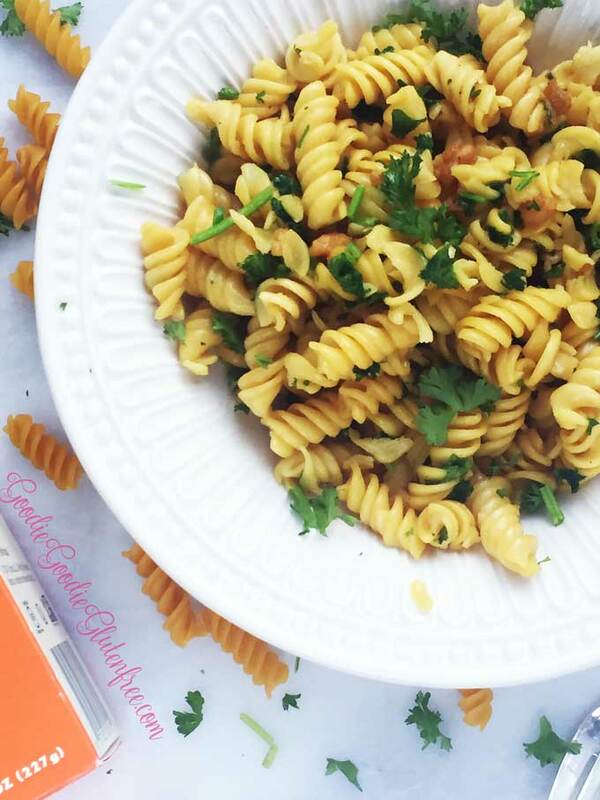 To this day it was the best thing I ever had when it came to a gluten-free pasta that made me feel good. And to this day it’s the only gluten-free pasta I choose to use. I like it more Aldente. So I don’t cook it for the full 8 minutes the box suggests. The moment it looks “ready” off the heat and into the strainer it goes. How do I know when it’s ready? Well, the noodles look more expanded. They look flatter, and lighter in color. That’s under 5 minutes to cook pasta. A pinch or two of Pink Himalayan sea salt or sea salt for added flavor – necessary for the garlic knot taste! Cook pasta according to the box directions and set aside. You’ll need 1 1/2 cups of cooked pasta for this recipe. On low heat in a soup pan simmer olive oil, 1 tablespoon of Italian Parsley, and 1/4 of the half of the garlic powder till warmed, about 1 minute. It will start to brown when warmed. Even if it gets too brown and you think you messed it up, keep making it. Once the oil is brown and the garlic starts to stick into clusters, set to the lowest temp possible on your stove. Add the cooked pasta, sprinkle the remaining garlic and Italian Parsley. Using a large spoon, massage and mix the pasta into the garlic sauce. Keep mixing until it is coated with the sauce. If you don’t have organic, don’t worry about it. You do what you can do. The idea is for this recipe is that cooking should be easy. I have only tested this recipe with Italian Parsley and dried garlic powder. You can alter it, but I cannot guarantee it will taste the same. Dried garlic powder is found in the dried herb section of the market. If you find this recipe too saucy, use more cooked pasta. 1 box of Banza - Your choice in shape, but not spaghetti. A pinch or two of Pink Himalayan sea salt or sea salt for added flavor - necessary for the garlic knot taste! You'll need 1½ cups of cooked pasta for this recipe. On low heat in a soup pan simmer olive oil, 1 tablespoon of Italian Parsley, and ¼ of the half of the garlic powder till warmed, about 1 minute. It will start to brown when warmed. Even if it gets too brown and you think you messed it up, keep making it.